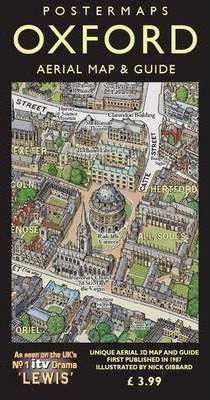 This unique illustrated map and guide to Oxford, England, is exceptionally clear and easy to use. Aerial 3D illustration of Oxford looking North, produced in stunning colourful detail by artist and illustrator Nick Gibbard. The colleges and major landmarks of the city stand out in all their beauty. First published in 1987 this map has been updated and the 3rd edition reprinted in 2011. An index of landmarks and colleges is given. Indispensable for cartophiles, students, residents and visitors alike.